How many leather fragrances do I own? Three. Chanel Cuir de Russie, Robert Piguet Bandit and Frédéric Malle Monsieur. Stand-out leathers are hard to find; many leather fragrances smell so similar. 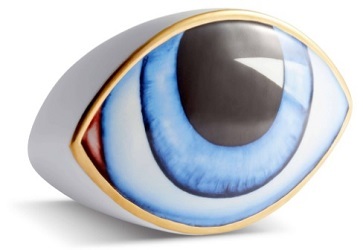 Cuir de Russie is a perfume version of a sleek, quirky, man-made bibelot (my house is full of these, too; see my current lemming — the eyeball paperweight from L'Objet —below). Bandit is more of a stand-out 'natural' object that's showy and hard to miss: a glossy chunk of red coral, say...or a hot-pink seashell the size of your head, a Haida basket full of aromatic betel nuts from India. Monsieur's raunch and libertine paunch prompts a "leather" virtual reality experience: a noisy leather-making factory in Morocco (there's dim light, Hasna blaring on the radio, sloshing of animal skins in vats filled with urine, merde du pigeon and the like). Cuir de Russie, Bandit and Monsieur are leather fragrances, but they have lots more happening in their development than leather — spices, aldehydes, galbanum, sonic patchouli, iris and other floral and fruit notes. 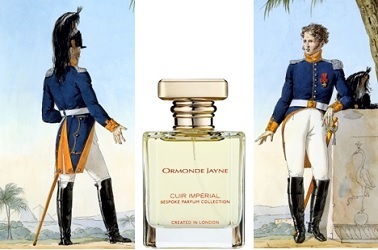 Compared to Cuir de Russie, Bandit and Monsieur, Cuir Impérial from Ormonde Jayne is rigorous, almost austere in character. To me, the "imperial" doesn't represent a life of luxury in a palace, but a no-nonsense, "big man on a big horse" cuirassier style. (Is there a perfume named "Cuirassier"...if not, why?) Like Monsieur, Cuir Impérial is a masculine take on leather, but with less liquor, sweetness and "roundness." Cuir Impérial* starts with notes of "cognac" and a hint of camphor mixed with bergamot and bright cardamom; there's a medicinal aspect to the opening. In mid-development, a sage-y smudge stick aroma, smoky and autumnal in character, appears. From this point, tarry birch emerges and takes over for the duration. Cuir Impérial's base has residual booze and birch, smooth cedar and light musk. Overall, Cuir Impérial is a forceful perfume (a few spritzes of Cuir Impérial on my chest produced enough sillage to scent several rooms in my house — admittedly mine is not an imperial-sized abode). You'll want to apply Cuir Impérial lightly the first times you wear it to gauge its impact on you...and those around you. If you apply Cuir Impérial on clothing, watch out: the sillage and lasting power will become astonishing. Cuir Impérial is made with wonderful, high-quality ingredients; there's not one moment that feels "off" or strident. If I were headed to the high desert this winter, Santa Fe or Taos, Cuir Impérial would be my trip perfume, to augment the New Mexican scents of wood smoke from fireplaces, piñon incense, creosote and rough landscape. Cuir Impérial would be a perfect angular addition to my favored leather perfumes. Ormonde Jayne Cuir Impérial is a limited edition and is exclusive to Harrods in the UK, £195 (US, $220) for 50 ml Eau de Parfum. *Listed notes of cognac oil, clary sage, bergamot, cardamom, pink pepper, orris, raspberry, rose, freesia, saffron, leather, tonka bean, patchouli, sandalwood, cedar, musk, incense and vetiver. Note: top images of La Grande Armée de 1812, 7th Regiment of Cuirassiers, Officers Full Dress by Carle Vernet via Wikimedia Commons. I don’t have a lot of leathers, sadly, but I do like the note. I don’t like fatty, ambery leathers though. Bandit gets a frequent wearing on my arm, and I like a nice iris-plush leather. I did just acquire a bottle of Bel Ami in the cocktail-shaker bottle and it’s been great. That leather is very soft compared to its spicy tendencies. Coumarin…Bel Ami is sensational. I forgot that one…I have a “cocktail shaker” as well. It’s so easy to wear, but interesting all the way down. I’m curious to try the new stuff but I’m sure I’ll be set for the next ten or so years! Original Bel Ami — what a great find, Coumarin! Thank you, Noz! I get very lucky from time to time! I’ll admit I’ve never tried Sycomore on skin, but it seemed very roasted on the strip. Bel Ami is cheerfully spicy, with a wonderful roundness due to the leather. BTW, I recently tested and got a guy I know to test Ormonde Jayne Black Gold. It lists a lot of fancy notes but basically centers on Iso E Super, to my nose, and I thought maybe it would be a subtly attractive fragrance for a guy, lightly applied. What slayed me was that my friend’s teenaged daughter didn’t like because it smelled like an “old lady perfume”! Who wants to tell Geza Schön? Noz…will read that article, thanks. And never tried the Black Gold. L’Objet…I try not to look there often! Once again, I could recognize Kevin’s wonderful prose after only reading a few sentences. I’m very fond of leather fragrances. I would have thought you were a Knize Ten kind of guy: I’m surprised you don’t have a bottle, because it’s such a classic, complicated leather, with all those layers of wood and floral notes. pyramus: I do love Knize Ten for sure. But I need to use at least 1/ 4 of the perfume I have before buying more! That eyeball is kinda disturbing. Wish I liked leather more, but am kind of a wimp. I’ll stick with Cuir Beluga (more vanilla than leather) and maybe Daimler Blond. Victoria at Boisdejasmin gave this a big thumbs up as well, so after reading your review, it looks like I need to give it a sniff. It’s been a long time since I tried any Ormonde Jaynes. I love your choice of the top image by the way! austenfan: yes, found a whole series of cuirassier art to choose from. Hope you find a sample of Cuir Imperial. I find Ormonde Jayne super generous with their supplies & samples – I have added a note when I do an online order & asked for a 2ml sample of their exclusives, and they are very obliging. And when you visit their boutique in London, they are so nice! Champagne & salty caramel chocolates last time offered by the nicest store manager…couldn’t say no!